The Eagles have released cornerback Ron Brooks, the club announced today. In related moves, Philadelphia has signed linebackers Carlos Fields and Christian Tago and waived cornerback Mitchell White. Brooks, 28, followed defensive coordinator Jim Schwartz from Buffalo to Philadelphia prior to the 2016 campaign, inking a three-year deal with the Eagles. Hampered by a quadriceps injury, Brooks only appeared in six total games before being placed on injured reserve. In that limited sample size (235 defensive snaps), Brooks earned poor marks from Pro Football Focus, which assigned him a 40.9 grade. Brooks had already agreed to a pay cut earlier this year that slashed his 2017 base salary from $1.85MM to $1MM and changed his 2018 season into an option year. Instead, the Eagles will now pick up $1MM in 2017 cap space and incur $250K in dead money. Another $250K dead cap charge will appear on Philadelphia’s books in 2018. 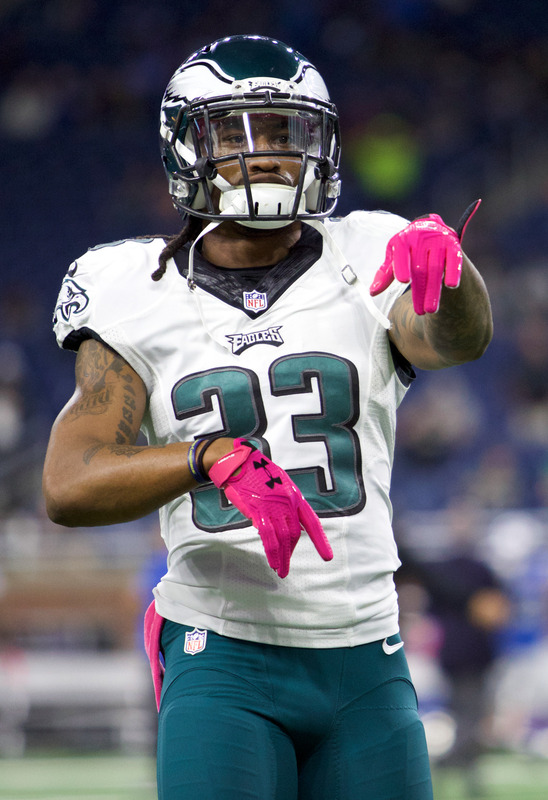 The Eagles have made several trades to acquire cornerback depth this offseason, picking up Ronald Darby from the Bills and Dexter McDougle from the Jets, but the unit is still relatively thin overall. Darby projects as a starter alongside Jalen Mills, while free agent signing Patrick Robinson now appears to have won Philadelphia’s nickel corner job, as Adam Caplan of ESPN.com tweets. Second-round rookie Sidney Jones is also on the roster but may get a late start as he recovers from a torn Achilles, while other Eagles corners include rookie Rasul Douglas, Aaron Grymes, and C.J. Smith. Raiders quarterback Matt McGloin, an impending free agent, said that he is seeking a place where he will get “a chance to compete for a starting role,” Josh Dubow of the Associated Press tweets. The 27-year-old has nine career starts under his belt, and he’s connected on 58-percent of his career passes for 1,868 yards, 11 touchdowns, and 11 interceptions. It sounds like Lions wide receiver Anquan Boldin is leaning towards a return in 2017. “I haven’t sat down with my family yet, but there’s still a passion that runs in me for football,” he said (via Nate Atkins of MLive.com). Boldin, 36, caught 67 passes for 584 yards and a team-leading eight touchdowns in 2016. Tight end Jermaine Gresham may have taken less money last offseason to stay with the Cardinals, but Kent Somers of AZCentral.com says we shouldn’t expect a repeat this time around. The 28-year-old impending free agent is probably eying his final chance to get paid, and he posted a solid statline of 37 receptions, 391 yards, and two touchdowns in 2016. Somers notes that the organization would like to re-sign the veteran tight end. Farhan Lalji of TSN reports (via Twitter) that the Calgary Stampeders of the CFL have released outside linebacker Frank Beltre, allowing him to sign with the Jets. It was reported this weekend that the 26-year-old had signed with New York. One of the more intriguing names featured on today’s reserve/futures contract signings was cornerback Mitchell White, who signed with the Eagles. The defensive back was a standout in the CFL, leading the Ottawa Redblacks to the Grey Cup. Aaron Wilson of the Houston Chronicle tweets that the Michigan State product also worked out for the Texans, Bears, and Bengals. As Zach Berman of the Philadelphia Inquirer tweets, this is the second straight season the Eagles have added a CFL cornerback, as they inked Aaron Grymes to a contract last year. The Falcons worked out several safeties today, including veteran Dashon Goldson, according to Adam Caplan of ESPN.com (Twitter link). Goldson has already spent time with Atlanta this season, appearing in four games for the club earlier in the year. The Falcons also took at look defensive backs Earl Wolff and Floyd Raven as they seek to replace Kemal Ishmael, who was placed on IR last week. Veteran linebacker Joplo Bartu met with the Dolphins today, per Caplan (Twitter link). Bartu has been in the league since 2013, and has 48 games of experience — including 28 starts — under his belt during time with Atlanta and Jacksonville. However, the 26-year-old Bartu hasn’t started a contest since 2014. The Bears worked out a slew of players on Monday, reports Brad Biggs of the Chicago Tribune (Twitter links). Chicago met with the following players today: defensive ends Jeoffrey Pagan and Mike Rose; linebackers Taiwan Jones and Frank Beltre; and defensive backs V’Angelo Bentley, Forrest Hightower, Dwayne Hollis, Rashaad Reynolds, and Mitchell White. The Seahawks visited with free agent running back George Winn, tweets Caplan. Winn, who has bounced on and off the Lions and Giants practice squads this season, could add depth on a Seattle roster that has already lost C.J. Prosise and Troymaine Pope for the year. Running back Terrell Watson tried out for the Eagles today, according to Caplan (Twitter link). Philadelphia recently placed RB Wendell Smallwood on injured reserve, meaning Watson — a former Bengals and Browns preseason star — could be a fit. A pair of Montreal Alouettes cornerbacks auditioned for the Cowboys this week (via ESPN’s Adam Schefter on Facebook): Mitchell White (brother of Giants wideout Myles White) and Mycal Swaim (brother of Cowboys tight end Geoff Swaim). White had previously worked out for the Cardinals, while Swaim spent time in Buccaneers training camp. The Seahawks auditioned four players today (via Aaron Wilson of the Houston Chronicle on Twitter): linebackers Curtis Grant and Zach Thompson and offensive linemen Ian Joseph and Julian Vandervelde. The Browns tried out kicker Kyle Brindza, tweets ESPN’s Field Yates. The 23-year-old has spent time with the Buccaneers and Lions. Yates also notes that running back Isaiah Pead visited the Vikings. The former second-round pick has compiled 78 rushing yards on 19 career attempts.